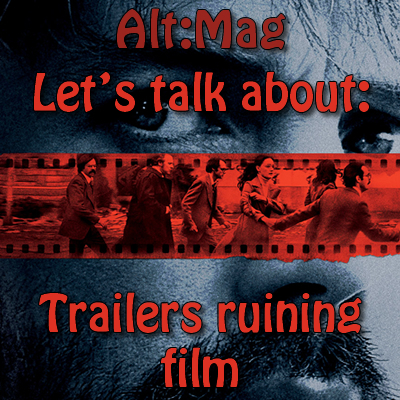 I went to see the film Argo the other day and I found that all the slightly funny parts of what was a serious film were ruined by the trailer. I'd seen the trailer a good few times before seeing the film and the jokes used are the sort where they are only really funny the first time, maybe the second time round at a push. This is something that happens a lot with comedy films; the funniest parts of the whole film are basically segued into a montage for the trailer. Which means you don't need to see the film anymore, as the other jokes are nowhere near as good and the good jokes you've already heard. At least 50 times. And it's not just comedy films that do it too; the latest James Bond film, Skyfall, has a very cool James Bond-y moment ruined in the trailers. And I seem to remember when Casino Royale came out there were trailers that revealed the un-Bondian moment where he got asked if he wanted his martini shaken or stirred and he replied, "do I look like I give a damn?" I could go on and on with other examples, but my point is that cool or funny scenes from films are becoming a lot less cool and unfunny, unless you haven't seen the trailer. Which in today's world is pretty hard to do. And we shouldn't have to avoid trailers, otherwise why have them in the first place? It seems the people in the marketing for films have forgotten what a trailer is supposed to do: give the potential audience an idea of what the film is about; showcase any big names that might be involved with it; show snippets of interesting/funny/intriguing/etc scenes that will get the audience interested. What they are NOT supposed to do is show the best of these scenes, otherwise they could be seen many times by any interested audience. If it's a comedy then the best jokes need to be saved for the film. What they could do though is use some of the weaker jokes or even edit scenes so that punchlines from one joke become a punchline for a different joke, meaning that both jokes are actually saved and are still funny when seen as part of the film. I understand they might not work all the time and might be quite difficult but even just a slight change in the trailer from how the joke is played in the finished film could keep it fresh. A non-comedic example would be in the trailer for The Dark Knight Rises. In the trailer Bane says "when Gotham is in ashes you have my permission to die". In the actual film it is said in a different order. I think it just helped to keep the line fresh again and went against expectations.